It’s Christmas in Slinky Malinki’s house and the rapscallion, mischievous cat is most curious about the Christmas tree. With its reindeer, ribbons, baubles and bells, it’s too tempting a treat for Slinky not to investigate. 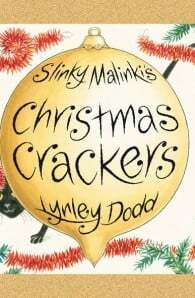 So Slinky Malinki, with mischievous glee, creeps out from the shadows to climb up the tree . . .